Are you looking to get into the exciting world of spinning reels? You’ll find that their simple use and easy maintenance will make for a great fishing experience regardless of what you want to do. We’re here to help you get started with some simple advice and a list of top 10 best spinning reels to get you going. Keeping these qualities in mind, let’s cover ten of the best spinning reels available on the market today. One of these is absolutely sure to meet your needs whether you’re going for bluegill, bass, or even tuna. 2.1 Why a Spinning Reel? Up first we have the Penn Battle 2. This reel comes in a large number of different sizes, with the biggest being suited for almost any application short of reeling in a tiger shark. 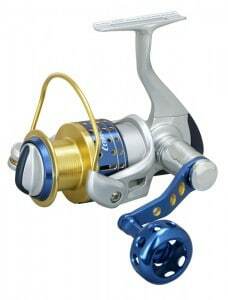 The reel itself has a sleek, efficient look and the thick aluminum bail is a great addition to the solid metal body. The upper limit of the drag on this particular reel is pretty strong, you probably won’t need to set it all the way up for most situations but the additional pounds of pressure are always good to have. Featuring a total of six bearings, this Penn reel won’t be the absolute smoothest but it’s well away from the bottom end of what you’ll find necessary. Penn’s anti-reverse mechanisms are among the best, and you’ll find that this reel allows you to quickly and accurately set your hooks with no chance of slipping. 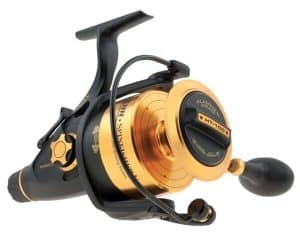 The only real disadvantage here is that a full metal construction makes this reel a bit heavier than some of its competitors, although certainly not into the seriously heavy range. Penn generally focuses on the basics when it comes to their reels, and you can rest assured that all of their lines are well designed and completely adequate for your fishing as long as you pick the correct size. Coming in at around $99-$129 depending on the size you need, the Battle II series is a great pick for any fisherman. The Penn Spinfisher V is a step-up from the previous reel. Featuring a wide range of models, with the biggest being quite heavy-duty, these reels are a great value to almost any fisherman. These reels all feature amazing line capacity, making them great for any kind of marine fishing. When your quarry decides to take a sudden dive you’ll be glad to know that only the most determined fish is going to be able to run your line out provided you keep it stored at full capacity. The gear ratios get a bit on the low side once you get into the particularly big models, making them ideal for groundfish as you can slowly pull your lead and entice them. With the biggest model, the SSV10500 you’ll be able to handle even large halibut in this manner. The reel itself is an attractive bronze color and is made of durable metal which will extend its lifespan for years. It may be a bit heavy, but you’ll be able to feel the absolute quality once it is safely in your hands. It also boasts an impressive drag force even for the smaller reels, and a wider range of drag means for a wider range of tactics when you’re pursuing your aquatic prey. Once you get the hang of the mechanism you’ll be adeptly tiring fish out in record time. These reels make for impressive workhorses, sure to serve you well on the ocean, and the lighter models will be suitable for all but the largest of freshwater fish. This is a pragmatic and solid choice to add to your equipment collection. The Pflueger President series honestly isn’t the greatest one on the market, but it’s a great value for the price. This light and capable reel series is great for any kind of freshwater fishing and will be sure to provide you with a pleasing angling experience. These reels have a large number of bearings and the retrieve is wonderfully smooth. The lower gear ratio might make this an ideal spinning reel if you want to crankbait for bass and it will also serve you admirably for lighter pan fish. The drag system on these is a bit light, meaning you may have to apply some finesse if you hook onto a big one since the spindle is a bit small to let fish swim themselves tired in most applications. With proper technique and some quick thinking you should be able to handle anything that hits though. The reel itself is a nice powder blue color and the aluminum spool features some gold trim. It makes for a pleasing, dignified look rather than the gaudy colors you’ll find on some cheaper spinning reels. Overall this reel will serve more than adequately as long as you don’t try to put it in the wrong situation. 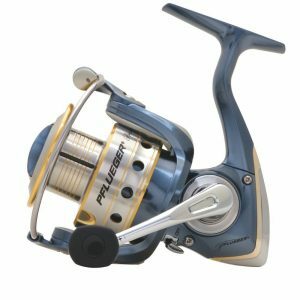 It really can’t be recommended for ocean use or going after monstrous catfish and gar, but if you’re just looking for a cheap reel to have some weekend fun on the lake, you’ll find the Pflueger President is just what you’re looking for. The Okuma Trio High Speed series is just that, with a great ratio of 6.0:1 gear ratio that’s sure to pull your line in quickly and surely. With ten bearings as well, this is a smooth actioned spinning reel which will be a delight in your hands. Its aggressive orange and black aesthetic is sure to make it stand out from the other reels in your collection as well, there’s no two ways about it, Okuma makes some great looking reels. The drag pressure is pretty hefty for light purposes, making it a rare occasion that you’ll need to actually set it all the way to the max. This would make an ideal reel for rock cod or flounder, it’s almost the perfect weight to work with in those areas and the heavy drag will be a boon with these hard hitting and swimming fish. The reel itself comes with numerous anti-corrosion features, which is a huge bonus for the marine fisherman. Anyone who’s spent some time fishing in the ocean will appreciate this, as most have suffered from a seized or broken reel at some point after forgetting regular maintenance. That isn’t to say you won’t have to perform upkeep on your reel after a long day of fishing, but if you forget in the excitement there’s a lesser chance of complete failure the next time you take it out. This reel doesn’t come in with the heft price of the high end Penn reels, but there really isn’t as wide of a variation in the models either. For medium-weight fishing with a spinning reel you’ll be glad you picked this one up though, Okuma makes fantastic reels with excellent durability and the Trio High Speed series fits that bill pretty much exactly. The Shimano Stradic CI4+ line of spinning reels is made of carbon fiber reinforced metal, making it the ultimate in lightweight durability. The rather high cost is indicative of this innovative material, which makes for an incredibly strong reel and frame that is sure to last for years given the proper treatment. There isn’t an incredible amount of range in size here like there is with Penn reels, but for light to medium fishing this series is an absolute winner. With proper maintenance this reel may be the last of its type you’ll ever have to buy, the unique material makes for absolutely incredible longevity. With seven shielded bearings you’ll be glad to know that this reel has smooth action and your performance shouldn’t be too hampered if you fumble it in the sand. With its fairly high gear ratio added on, you’ll find this reel is absolutely great for flatfish and ray fishing from the coastline, where these hard fighters sometimes need to be pried off the bottom. One of the more unique features here is that the Shimano Stradic CI4+ series of reels has a criss-cross patterning to your line, far from just looking different this makes for less friction on the line and you’ll be able to cast farther and more quickly than with the standard configuration. The gear ratio also ensures a quick retrieval of your line, making this an ideal reel for hard fighting fish, although if you hook a real whopper some hand pressure may need to be applied due to the lower pressure drag system. The Shimano Stradic CI4+ series is a great reel to add to your collection, but its high price may not make it ideal for those on a tight budget. If you make the investment and take proper care of it though, it is sure to last for a long time to come. 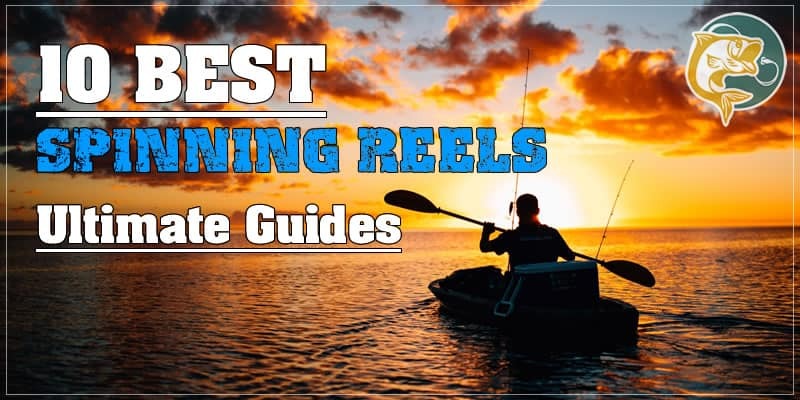 The Okuma Cedros High Speed spinning reel is yet another great Okuma reel that makes this list. This one is specifically designed for saltwater fishing, making use of a lot of anti-corrosion technology in order to enhance the length you’ll be using this reel. It’s also made of die-cast aluminum which makes for a reel which is easier on your hands and wrists during those prolonged sessions on the boat. The gear ratio on this reel is fantastic, this is a great high speed reel with an amazing retrieve per rotation of the handle. It may be a little light on bearings, but it’s still in an acceptable range and sure to be pretty smooth. The drag system here steps things up a notch from the much lighter Trio High Speed series, and you’ll have a lessened need for hand finessing the line if you stay in the same ranges. With the bigger models you’ll also be pleased to see that it holds an extremely considerable amount of line, which is exactly what you want when you’re fishing on the ocean. The only real flaw with this product, aside from the limited number of bearings, is the aesthetic. 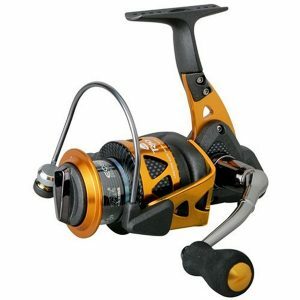 It’s a bit on the wrong side of gaudy, although not as bad as it could be, but for the price you’ll find this durable reel may be exactly what you need to get started with spinning reels for the budding marine fisherman. 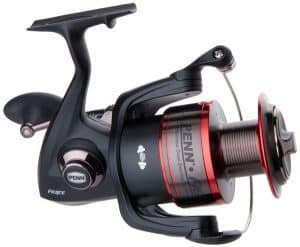 The Penn Fierce series of reels is one of the cheapest lines that Penn has to offer, and that makes it a great bargain because Penn products are absolutely magnificent. The two models offered here differ greatly in their capacity and use, as you can see from their differing statistics and either is a solid buy for the angler looking to make a cheap and lasting investment. The Penn Fierce series has a great line capacity, and while the statistics on the two models might seem to be quite different they both provide roughly the same function just for different sized fish. The Penn Fierce 2000 is a great reel for lighter freshwater fishing, and the 7000 features similar features but will let you go for trophy fish without any difficulty. These reels are high speed, and feature pretty good drag pressure for their differing purposes. The lack of bearings may not make for the smoothest action possible, but it’s definitely sufficient to keep you from extremely jerky action. Whether you go with the 2000 or the 7000 is up to personal choice, but their roles in your tackle are quite different. You’ll find either great for freshwater fishing, and the limited number of choices makes picking one out quite easy. They’re also sufficient for saltwater fishing, but without anti-corrosion features you’ll need to be sure to thoroughly maintain this reel after every session in order to keep it going strong. The series features a mild black and red aesthetic, these no-frills reels are meant for work and you’ll be greatly pleased with their performance once you make that first, decisive cast. 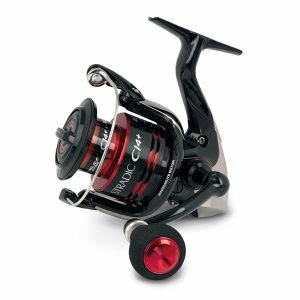 These reels are an absolute bargain, and with their low cost you’re sure not to be disappointed with their great performance. 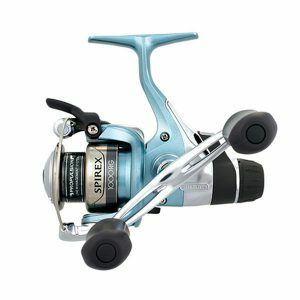 The Shimano Spirex spinning reels are an absolute bargain, they’re cheap and sturdy and make a great first foray into spinning reels for the novice. They don’t have the most features or the best statistics, but these aluminum reels are durable and ready to go. These are definitely a reel for light fish, and if that’s your pleasure you could do a lot worse than picking up one of these extremely well priced reels. It has six bearings and a pretty high gear ratio, making this perfect for those lazy afternoons by the lake or creek when you just want to have a little bit of fun. The stand-out feature here though is that this reel is capable of being cast with one hand due to a unique trigger mechanism. This feature is only sometimes found on spinning reels, and it does make a handy little addition to a reel that would be decently priced even without it. This certainly isn’t the best reel available, but if you’re the weekend warrior type or want to set up your child for his first time going for pan fish this is probably the reel for you. The ease of use, high gearing, and cheap pricing make the Shimano Spirex RG series good for some purposes, but the serious angler will probably want to pass this one up in favor of something a little more serious. Another great product from Okuma, their standard speed Trio series has a lower ratio than the High Speed Trio and is perfect for dragging on particularly hard fighting fish. With its corrosion resistant coating it makes for a great saltwater reel which is sure to help you land some of the fish of your dreams. When you want something low geared but still of exceptional quality, this is a great rod to turn to. Okuma uses a lot of advanced technology in their designs, and these reels in the mid-range of their products make great use of it. The drag might be a bit light though, so depending on what exactly you want to do with this piece of equipment you might end up having to use quite a bit of pressure on the line with your hand or thumb in order to keep things going. With ten bearings, anti-corrosion coatings on several parts, and the Okuma name one thing you know for sure is that this reel is smooth. You’ll have an easy time pulling in your fish, making the whole day easier on your hands and wrists. If you’re looking for a low geared spinning reel for your marine fishing, you’ll definitely want to take a look into picking out the correct size of the Okuma Standard Speed Trio series of reels. They also have a year-long warranty, meaning you can trust their product. The Penn Fierce FRC8000 model is a beast. We reviewed it by itself, because this reel is capable of a lot more than the others in its category. You’ll find that this is an absolute monster compared to most of the spinning reels on this list. It’s not the prettiest reel, but its aesthetic speaks to pragmatism. Penn makes great reels for all purposes, and this one has a definitive purpose. It’s a heavy, low geared reel designed to catch large fish, and that is exactly what it will do for you. If you’re the type who always wants to go for the biggest game available, this is probably the absolute best you can do at the price. The Penn FRC8000 is simple, sturdy, and lives up to its name. The only real drawback is that despite being such a beast it has relatively low drag pressure, but as we learned earlier you can finesse that in order to bring in your hooked fish. You’ll be able to set your hooks hard and fast as well with the anti-reverse feature. 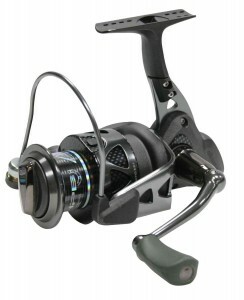 With the Fierce II series now out, you can get this impressive reel for a bargain price as well. There may be better spinning reels for thresher shark and other large marine prey out there, but you certainly won’t find them at this price. You’re sure to be impressed with this purchase. If after reading all of this, you’re still lost on what you want out of a spinning reel I recommend going with the Penn Fierce series. They’re an extreme bargain for the price, and Penn simply can’t be beat. The reels will work great for fresh or saltwater, and with it you can confidently step forward for an amazing reel at a bargain bin price. 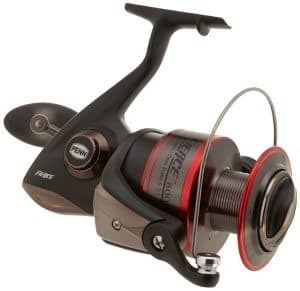 If you want to make a step-up in the size of your fish, I would also recommend the Penn Fierce 8000 which we reviewed separately, but any of this series are sure to leave you satisfied. The foremost advantage of a spinning reel of their simplicity. Many anglers who started with one would agree, they aren’t the fiddliest reels but this simplicity allows for an amazing versatility and ease of use. All you’ll need to do is flip the bail over, cast out, and lock your line back down and your case is good to go. You’ll also find that you don’t need to mess with the drag settings or brakes in order to get a good cast like you would with a bait-casting reel. A bad cast with a bait-casting reel can leave you with a rat’s nest of tangled line, and on a particularly disastrous cast you might even find yourself having to cut your line and possibly lose precious lures in the process. This simply will not happen with a spinning reel, there’s no need to mess with anything at all in order to get that perfect, accurate cast. Some anglers may find themselves using lighter bait, and a spinning reel is perfect for that. You’ll find yourself lobbing your assorted tackle out with amazing ease and simplicity, and there will be no need to mess with the settings in the event that you decide to change tackle as the day goes on. One less obvious advantage to a spin casting reel is that you can apply additional drag with your hands, whether you’ve just hooked a monster and the reels own drag capacity isn’t functioning to your liking or if you just can’t be bothered to mess with the switch you’ll be pleased to be able to finesse the line exactly to your advantage. There’s quite a bit to study anytime you’re looking to make an informed purchase of a reel, but we’ll break it down pretty simply for you here in order to give you the best chance of making a knowledgeable choice to find the reel that is perfectly suited to your needs. The reel’s body is best made of a light material. With the new materials used and advanced skeletonizing techniques available a spinning reel can be deceptively light at times. These light reels may still be capable of landing big ones, provided they’re made with the proper materials and don’t feature any structural flaws. It’s important to take a look at the capacity of line that your reel will hold in order to best pick one to suit your needs. 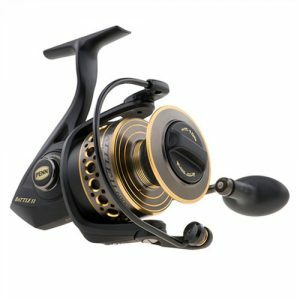 If you’re going for smaller fish in a freshwater setting you’re probably best off picking a smaller and lighter reel to save the effort on your wrists and hands, but if you’re fishing for big marine life you’ll want a much larger reel rated to hold huge amounts of line to increase your chances of success. You’ll want to select the proper gear ratio for your needs, quicker line retrieve isn’t always the only thing you want to look for. When you’re looking at a gear ration like 6:1 what it means is that the smaller gear in the reel’s innards will turn six times to each single revolution of the reel’s handle. A higher gear ratio means faster retrieve, and for some applications you may want a slower one, so think carefully about this quality before making your purchase. Most drag systems are only rated for their maximum drag, but this can be one of the most important considerations. With proper application of drag you’ll be able to tire the fish out more quickly, but you don’t just want to set it as high as you can or you may risk broken equipment when you hook the big one. Remember that with spinning reel you can safely apply your hand which will allow you to increase pressure over max, or make for quick and surprising changes that will help to tire out your hooked fish. It’s important to know how many additional ball bearings are in your reel, and in this case the more there are the better. Extra bearings will make for an exceptionally smooth action, which will allow you to avoid jerky motions or your handle getting caught in a tight location while you’re retrieving your fish. The spool of a reel will often be made from a different material than the main reel body, and this can affect the total weight of the reel. Ideally a smooth, tough material will be used in order to create a great amount of longevity for your reel and maintain great, smooth action. If you’re purchasing a quality, this is an absolute given. With a good anti-reverse you’ll be able to set your hook sharply once you feel that bite, increasing your chances of success. If a spinning reel lacks this feature, you’ll definitely want to give it a pass.